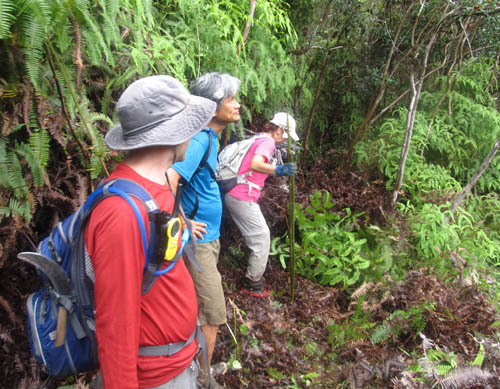 I joined the trail clearing crew of the Hawaiian Trail and Mountain Club (HTMC) to reopen the old ditch trail that contours against the Koʻolau Mountains in the very back of Kahana Valley. 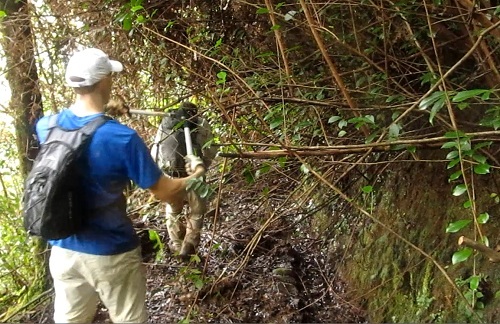 This was the club’s second work day to restore the stretch of the old Waiahole Ditch Trail in the back of Kahana Valley — what we call the “Kahana Ditch Trail”. Part of HTMC President Jay Feldman’s initiative to reclaim old hiking trails that have been “lost”, the club is reclaiming trails that are no longer on the hike schedule due to fast growing vegetation, fallen trees and landslides. 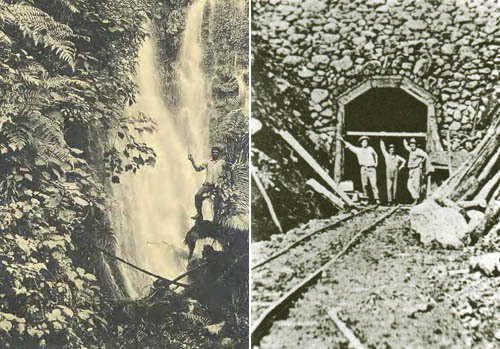 Built from 1913 – 1916, the Waiahole Ditch Trail services the Waiahole Ditch Irrigation System that transports water over a distance of 25 miles from the wet windward valleys of Kahana, Waikane, and Waiʻahole through a tunnel under the Koʻolau Mountains to the dry leeward-side of the island. This feat of engineering allowed the plantations to cultivate crops where sunshine was plentiful but water was scarce. 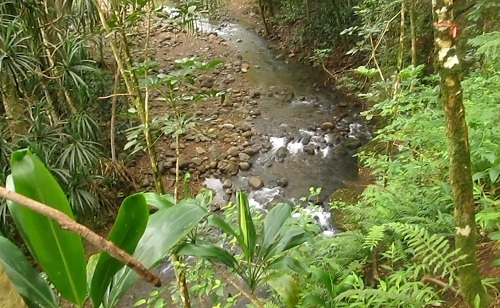 It did however, have a detrimental effect on taro farmers and stream wildlife where the water was taken — particularly in Waiʻahole and Waikane. To learn more about the dispute over water rights and the landmark rulings made by the Hawaiʻi Supreme Court in 1997, take a look at the sources at the end of this article. After rendezvousing at the front of Kahana Valley and signing work permits, we drove through the locked gate to park in the grassy field mauka of the dam, and hiked to the end of the road to the water tank. 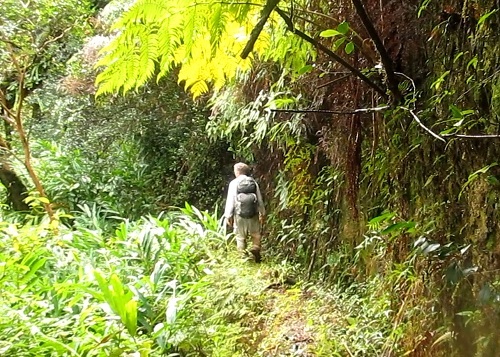 We then made our way on the Nakoa Trail. The day was dark and overcast day as we took the fastest route on the “figure 8” Nakoa Trail to reach the back of the valley. 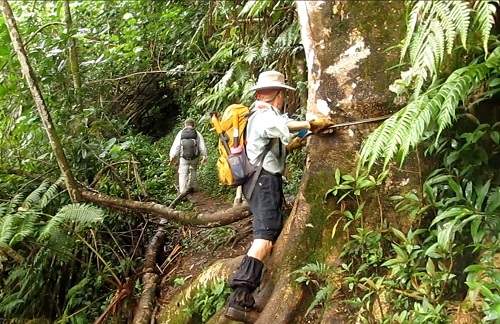 We hiked past old World War II pillboxes under the shade of hala trees and continued on to contour above the stream. 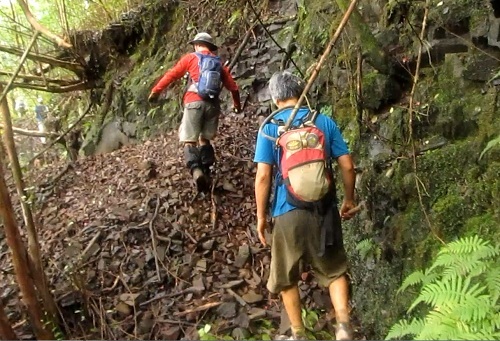 After passing a small ravine gouged through the trail leaving a field of boulders in its wake, we reached the outer most extent of the Nakoa Trail. 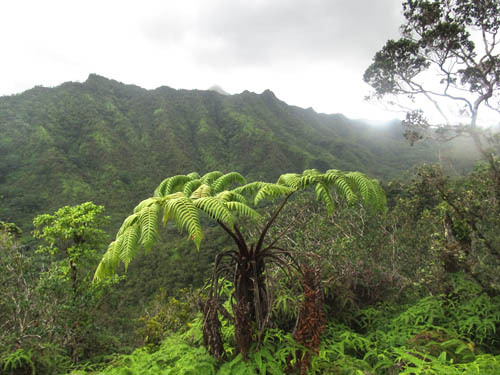 We then veered-off to begin a slow climb up a series of low ʻuluhe covered hills that parallel Pauʻao Ridge up to the Koʻolau Pali. 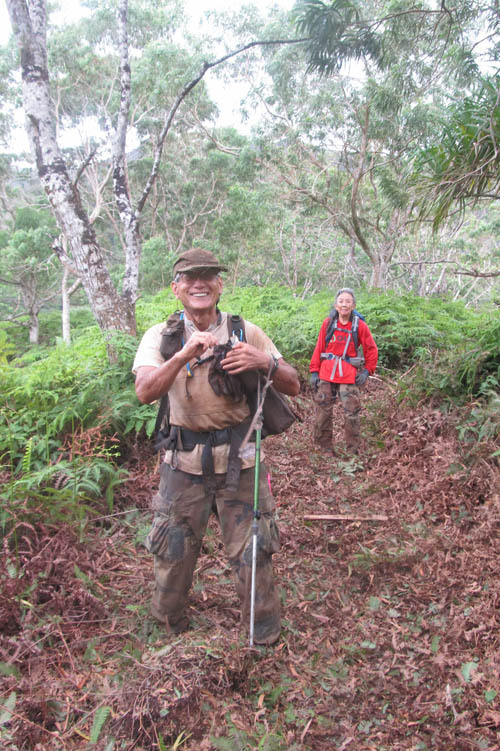 Many thanks to Thomas Yoza who weed whacked this stretch of the trail during the week and Charlotte Yamane who initially navigated the route on the club’s first work day, we made our way beyond the ridge in the center of Kahana Valley — where Puʻu ʻO Kila and Koʻiele are situated — to reach the wall of the Koʻolau Pali. 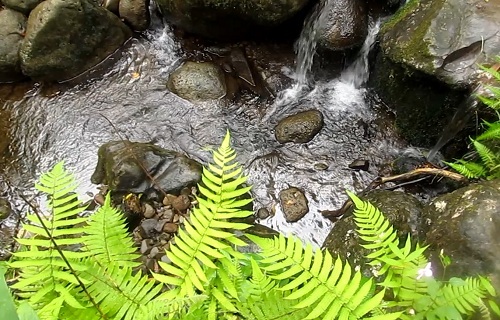 We crossed a charming stream-let with miniature waterfalls and pools with ferns on the margins of the stream. After crossing another stream-let which gouged its way over the landscape, we reached the start of the old Waiahole Ditch Trail. 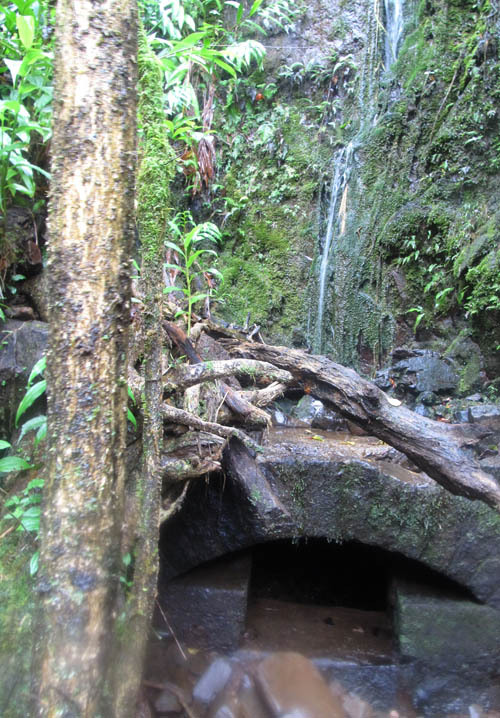 The ditch trail contours in and out of numerous ridges and gullies carved against the Koʻolau Mountains to service a system of interconnected tunnels constructed by Japanese stone masons that capture surface water from each natural drainage along the way. 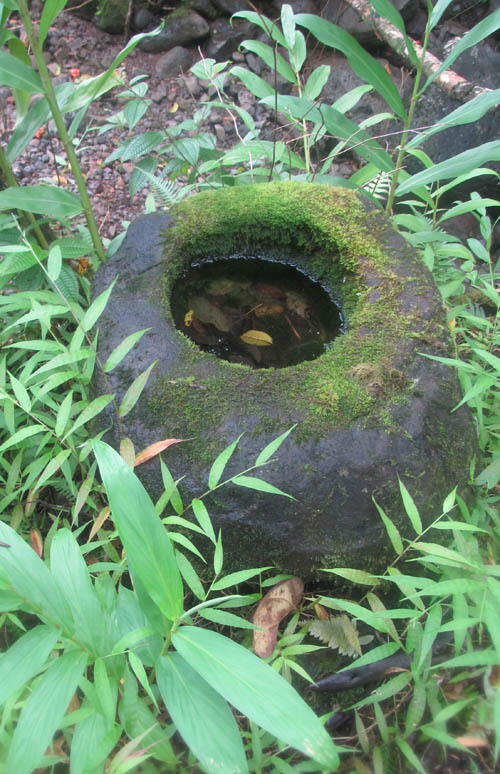 One of the more interesting artifacts along the trail is what we speculate to be a mochi pounding stone bowl made by the Japanese stone masons who built the tunnels. Some sections of the old ditch trail were in surprisingly good shape — the trail was completely intact and clear of vegetation to the wall. Unfortunately, intact sections were the exception rather than the rule. The worst sections were blocked with blown down trees — many of which were too thick to be cut with the small handsaws we carried. We need to bring chain saws next time to remove this blockage from the trail. 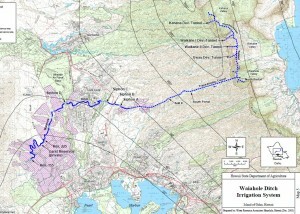 Where the trail contours into folds between ridges we saw how the tunnels capture the water. 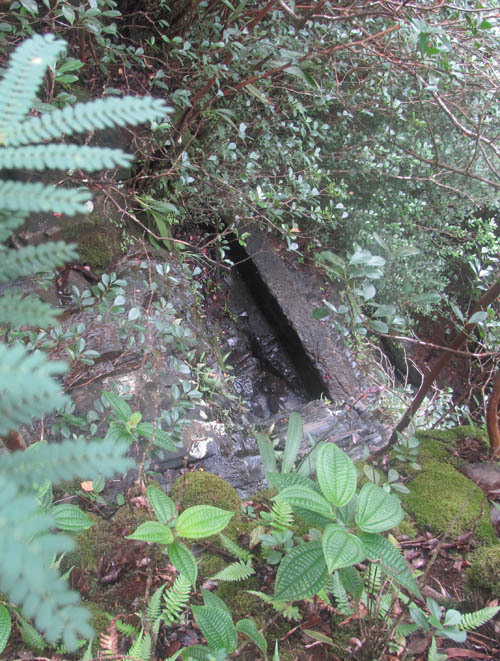 When I poked my head into the tunnel, I could see water flowing and feel a breeze. 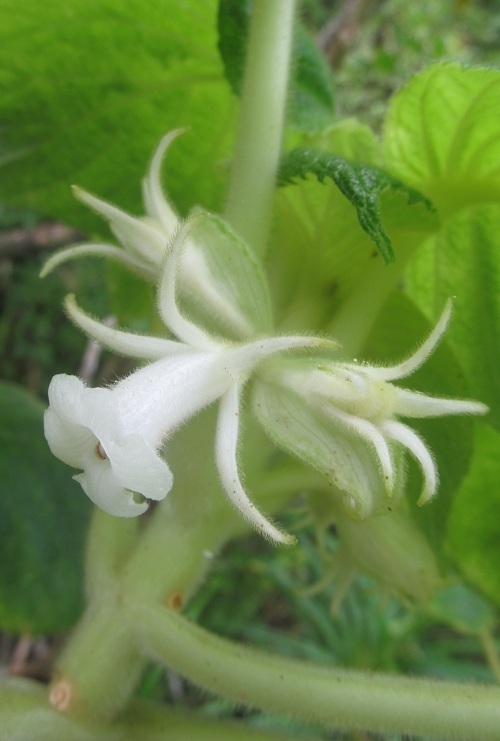 Some of these drainages were home to rare native plants like this haʻiwale (Cyrtandra kalihi) which has small white hairy flowers no more than half-an-inch long. 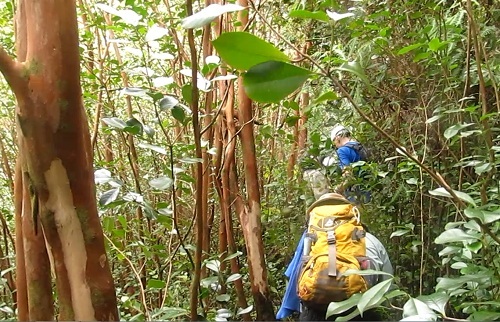 Other sections of the ditch trail were overgrown with invasive strawberry guava whose branches create a thicket that is difficult to pass through. 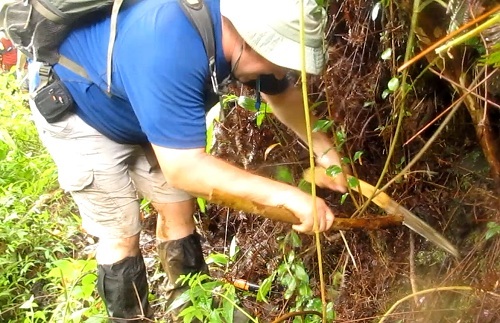 Much of our effort involved cutting back branches with loppers, hand saws, and machetes. One of the more interesting ferns I stumbled on was identified by fern expert Kay Lynch to be Adenophorus pinnatifidus var. rockii. 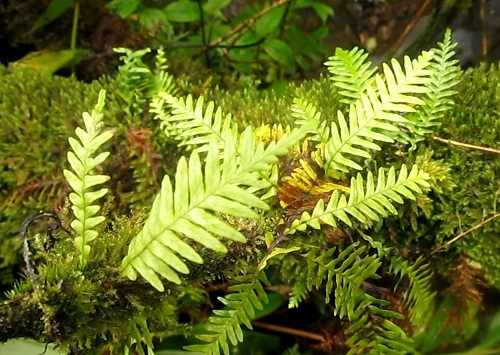 The cute little ferns no more than 3 inches long were growing on a moss covered branch at the entrance to a wet ravine. When lunch time rolled around we rested on the outer most part of a prominent ridge that descends from the very back of the Koʻolau. Several of us pushed out as far as we could on the ridge though ʻuluhe to get a better view of where we were situated in the valley. We could see the peaks of Puʻu ʻO Kila and Koʻiele in the middle of Kahana Valley and appear deceptively gentle from this angle. From our vantage point there appeared to be 4 more majors ridges — like the one we were one — before reaching Waikane Valley. 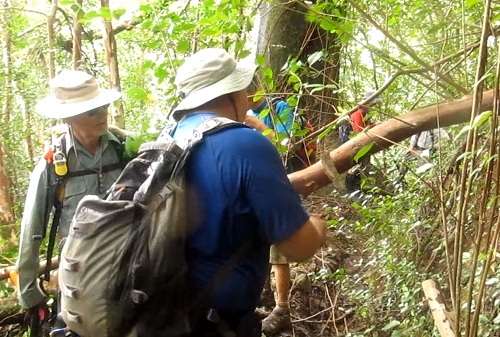 After eating our lunches we pushed on through a thick growth of guava saplings — cutting them back with loppers. The sad thing is that there are so many guava plants that another one will grow back to take its place and more work will be needed to keep the swath open. Other sections of the trail were covered with landslides. Fortunately, this one wasn’t too bad and we were able to climb over this one without difficulty. When we reached the next major drainage we could saw another structure built by masons to capture surface water. 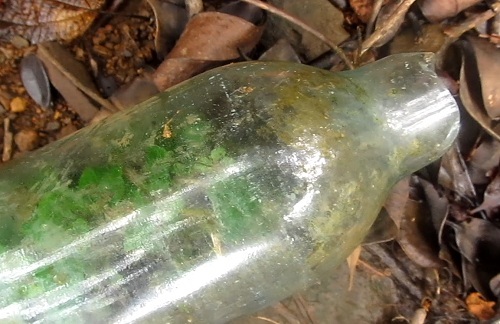 One of the more unusual sights we saw on the trail was a “terrarium” where tiny ferns had spontaneously grown in an old bottle. When we reached our turn around time at 2:30 PM, we cut through our last guava blow down for the day. 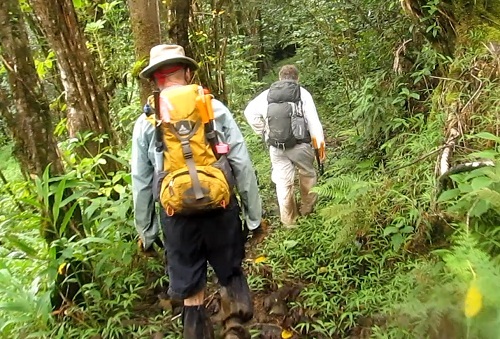 We advanced another half mile on the trail and will have to return another day to reach the Waikane Saddle. 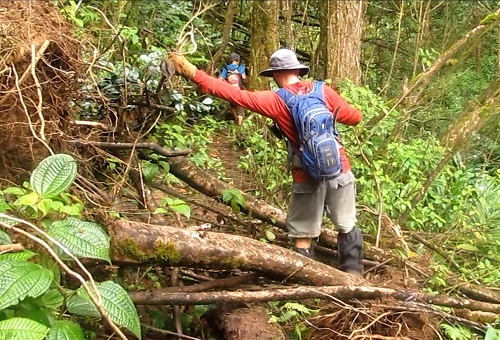 While making our way back out, we saw what a great job the crew did removing ʻuluhe and ginger that clogged the trail. While making the 4.5 mile return trip, I reflected on the huge effort it took to engineer this irrigation system and the labor we are putting in to restore the trail. 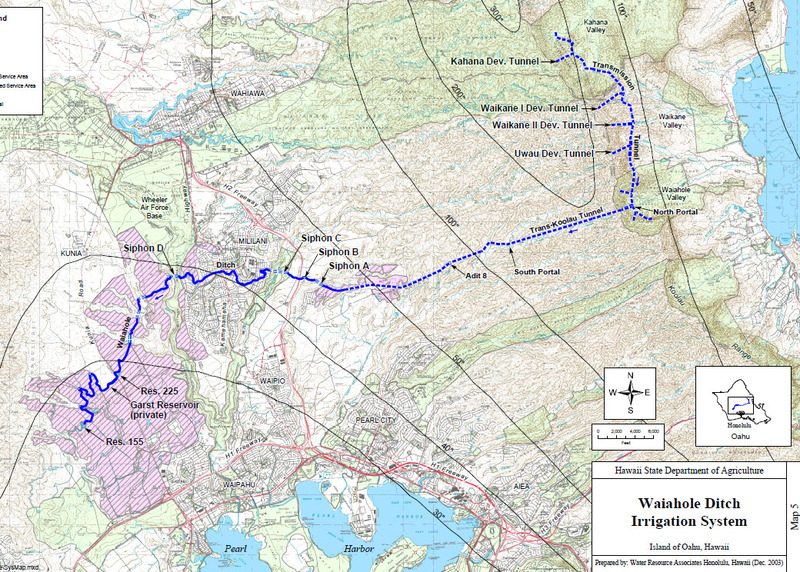 With just another mile or so more to go, the “Kahana Ditch Trail” will soon be open to Waikane! 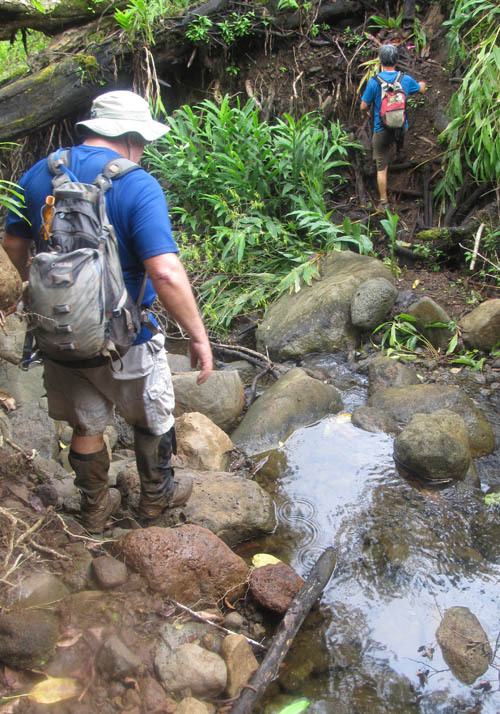 A couple years ago, I led a group of Boy Scouts and their leaders from Waikane to Kahana using the ditch trail. 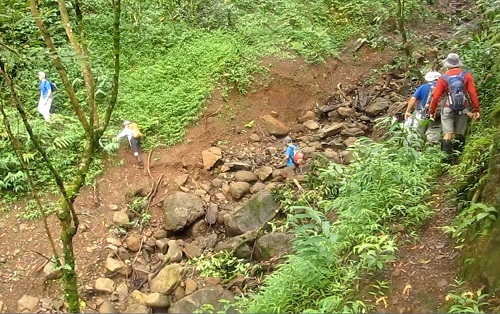 The descent to the floor of Kahana Valley from the Waikane saddle via switchbacks was marred by many washed out/landslid sections. Lots of work will be required to make those sections hikeable. The best/fastest approach to do this work is from Waikane. Deep, deep in the back of Kahana I was amazed to find some recently cleared sections of the ditch trail sandwiched between sections that were very overgrown. I wondered who had cleared those sections and what for. Whatever the case, I appreciate the report, Nathan. Well done.